A new deal every day from Audible. Today’s deal ends 08/20/2017 @ 11:59PM PT. Rarely does a week go by without a well-known executive being indicted for engaging in a white-collar crime. Perplexed as to what drives successful, wealthy people to risk it all, Harvard Business School professor Eugene Soltes spent seven years in the company of the men behind the largest corporate crimes in history – from the financial fraudsters of Enron, to the embezzlers at Tyco, to the Ponzi schemers Bernie Madoff and Allen Stanford. 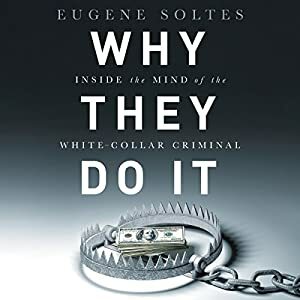 Soltes refutes popular explanations of why seemingly successful executives engage in crime. White-collar criminals, he shows, are not merely driven by excessive greed or hubris, nor do they usually carefully calculate the costs and benefits before breaking the law. Instead, he shows that most of these executives make decisions the way we all do – on the basis of their intuitions and gut feelings. Based on extensive interaction with nearly 50 former executives, Soltes provides insights into why some saw the immediate effects of misconduct as positive, why executives often don’t feel the emotions most people would expect, and how acceptable norms in the business community can differ from those of the broader society.